History of the Earth could use some help. Please research the article's assertions. Whatever is credible should be sourced, and what is not should be removed. And then mankind fell off the Flat, Spiral Earth. The universe is approximately 13.7 billion years old, its existence traceable back as far as an event in space-time known as the Big Bang. Scientists are unsure what caused this event but postulate that matter, space and time itself came into being from a single point in the universe in an initial expansion and that the universe has been expanding ever since. This single point is known as a singularity. Because of the Big Bang, subatomic particles formed into atoms, atoms into molecules, right up to the formation of stars. Stellar evolution and the supernovae of stars led to the formation of all the heavy elements that are required for life on Earth. Our Earth formed quite some time after the universe did, some 4.57 billion years ago (bya). Our planet happens to be in the habitable zone for life. Venus is too close to the Sun to be habitable, and a runaway greenhouse effect due to a large amount of volcanic eruptions in the geologic prehistory of Venus has rendered the planet uninhabitable. Mars is further away but if the atmosphere was thicker, life might be possible there as well, although it would still be a harsher existence than here on Earth. Conditions on Mars would be comparable (or worse) to Earth's Arctic, but without most of the air (or any of the oxygen or reliable surface water). The average surface temperature on Mars is -80°F (-60°C), with a summer equatorial daytime temperature of a balmy 70°F (20°C) but dipping down at night to -100°F (-73°C). Some scientists believe that microscopic life did once exist on Mars when it was covered by oceans around 4 bya in the Phyllocian era of Martian prehistory. Scientists do not rule out the possibility of primitive life now. For the first 500 or 600 million years of the Earth's history, scientists believe that there was no life. The planet was constantly bombarded by meteors and comets and a collision with a Mars-sized planet known as Thea is believed to be what formed our moon. Around 4.4 bya, scientists believe that Earth developed oceans. This likely occurred because icy comets, or more likely asteroids, collided with the Earth. The hydrogen-deuterium ratio in most comets is dissimilar to that in Earth's water, whereas the ratio is similar for most asteroids. An atmosphere formed and rain began to fall. Around 4 bya, scientists speculate that life began to form. The Hadean was the first period in Earth history. The Hadean occurred around 4.57 bya to 3.85 bya. The first self-replicating RNA molecules appeared during this time around 4 bya. Also the atmosphere, the moon, and the oceans formed during the Hadean. The Hadean eon is sometimes divided into four unofficial eras the Cryptic, Basin Groups, Nectarian and the Lower Imbrian that correspond to lunar geologic eras. The Archean was The second eon in geological history. The Archean occurred between 3.85 bya to 2.5 bya. The first simple prokaryotic cells appeared. Photosynthesis also evolved in the Archean. The atmosphere became oxygen-rich and the first supercontinents Vaalbaria, Ur and Kenorland formed during this time. The earliest rock formation on Earth, the Isua greenstone belt, also formed during the Archean eon around 3.8 bya. The Archean is divided in to 4 eras: the Eoarchean, Paleoarchean, Mesoarchean and the Neoarchean. The Eoarchean was the first geological era of the Archean eon. The Eoarchean lasted from 3.8 bya to 3.6 bya. The first supercontinent Vaalbaria appeared in the Eoarchean Eon around 3.6 bya and broke up completely around 2.8 bya in the Mesoarchean era. The oldest rock formation on earth the Isua greenstone belt appeared during the Eoarchean around 3.8 bya and contain bands of organic carbon witch may indicate that photosynthesis evolved during the Eoarchean era. The name is derived from two words eos (dawn) and archios (ancient). The Paleoarchean was the second era in the Archean eon. The Paleoarchean spans the period of time around 3.6 bya to 3.2 bya. The first ascertained life form (A unicellular stromatolite colony dating from 3.5 bya found in Australia) appeared in this era. Also the first 2 of the 3 domains of life on Earth, the archaea and the eubacteria descended from the Last universal ancestor (or the theoretical latest living organism or organisms that all modern life on earth descended from) during this era. Unicellular colonies of cyanobacteria known as stromatolites that were common throughout both the Archean and the Proterozoic first appeared in the Paleoarchean era. Stromatolites were common in the Mesoarchean and the Neoarchean eras. The Mesoarchean was the third geological era within the Archean eon. The first supercontinent Vaalbaria which formed during the Eoarchean around 3.6 billion years ago broke up completely during this period around 2.8 billion years ago and a new supercontinent Ur formed around 3 billion years ago. Although stromatolites appeared earlier in the Paleoarchean stromatolites only started to become common in the Mesoarchean era. The Neoarchean era was the final geological era in the Archean eon. the Neoarchean spans the period of time from 2.8 bya to 2.5 bya. Oxyphotosynthesis first evolved in the Neoarchean and was probably the cause of the environmental crisis known as the Great Oxygenation Event that happened around 2.4 bya in the following Paleoproterozoic era due to a poisonous buildup of oxygen in the atmosphere produced by the oxyophotosynthesing autotrophs which evolved in the Neoarchean around 2.7 bya. A new supercontinent Kenorland also formed in the Neoarchean around 2.7 bya. The Proterozoic happened around 2.5 bya to 542 million years ago (mya). The last eon of the Pre-Cambrian period. The Proterozoic saw the evolution of advanced unicellular and multicellular life such as the Ediacaran Fauna. The first primitive plants and animals near the end of this period around 600 mya. The Proterozoic eon is divided into three eras: the Paleoproterozoic, Mesoproterozoic, and the Neoproterozoic. The Paleoproterozoic is the first Geological era of the Proterozoic eon, occurring around 2.5 bya to 1.6 bya. Complex cells known as Eukaryotes evolved around 2.1 to 1.6 bya in the Paleoproterozoic through a fusion of two or more cells probably as a survival response to the extremely oxygenated atmosphere, a result of the Great Oxygenation Event that occurred around 2.4 bya in the Siderian period of the early Paleoproterozoic. This extreme amount of free atmospheric oxygen resulted from the evolution of oxyphotosynthesis around 2.7 bya in the previous Archean eon, the abundance of which caused an ecological crisis that resulted in the extinction of many forms of life on earth due to the fact that most life on earth (with the exception of the oxyphotosynthesers) was adapted to carbon dioxide rather than oxygen. The Archean continent Kenorland broke up in the early Paleoproterozoic and the Paleoproterozoic supercontinent Colombia formed around 1.8 bya and broke up around 1.5 bya in the following Mesoproterozoic era. One of the most severe ice ages in geologic history, the Huronian glaciation, occurred around 2.4 bya to 2.1 bya possibly as a result of the oxygenated atmosphere and the absence of greenhouse gases such as methane and carbon dioxide that resulted from the Oxygen Catastrophe. Some scientists believe that the Huronian glaciation was a worldwide ice age similar to the snowball earth event which happened later in the Cryogenian period of the Neoproterozoic Era around 850 to 630 mya. The Mesoproterozoic was a geologic era that occurred between 1.6 bya and 1 bya. The paleoproterozoic supercontinent Colombia broke up during the Mesoproterozoic era around 1.5 bya and a new supercontinent, Rodinia, formed around 1.3 billion years ago from about three pre-existing continents, in an event known as the Grenville orogeny. Rodinia became fully assembled around 1 bya and broke up around 750 bya in the Neoproterozoic era. Rodinia may also have been responsible for the generally cold climate of the following Neoproterozoic era. Other events that occurred in the Mesoproterozoic era include the appearance of the first multicellular organism which was a red algae known as Bangiomorpha pubescens. B. pubescens appeared around 1.2 bya and the evolution of sexual reproduction occurred around the same time that B. pubescens appeared. Also all geologic activity on the Moon stopped around 1.1 billion years ago in the Mesoproterozoic era. Global ice sheets may have delayed or prevented the establishment of multicellular life during the Snowball Earth event. Tonian period. Also the first true animals appeared around 600 mya in the Ediacaran period of the protozoic and were accompanied by an enigmatic set of fauna known as the Ediacaran Biota which appeared around 610 mya and have been described by scientists in many ways as being a totally new phylum of animals, as a group of cnidarians or as being related to modern animals (such as Spriggina which may have been a possible precursor to the trilobites). The first fossil Bilaterian animal, Vernanimalcula guizhouena, also appeared in the Ediacaran period of the Neoproterozoic around 580 mya. Also the earliest animal with sight and eyes and the first possible anomalocarid, Bomakellia kelleri, evolved during the Ediacaran period. The late Mesoproterozoic and early Neoproterozoic supercontinent Rodinia completely broke up in the Neoproterozoic around 750 million years ago in the Cryogenian period. It is thought that the supercontinent Rodinia played a major role in the Snowball Earth event and caused the cool climate of the Neoproterozoic as well as possibly playing a part in the origin of the first animals. A worldwide ice age known as Snowball Earth occurred between 850 and 630 mya. Volcanoes possibly ended the snowball earth event by releasing CO2 into the atmosphere which trapped heat and warmed the Earth's climate. Some scientists believe that the Snowball Earth event spurred on the diversification of life at the end of the Proterozoic and the beginning of the Cambrian known as the Cambrian Explosion, while others believe that the Snowball Earth Event delayed the diversification of multicellular life. The Neoproterozoic ended around 542 mya when the first abundant shelled animals appeared. The Tonian (from Greek tonas, "stretch") is the first geological period of the Neoproterozoic era. It started around 1 bya and ended around 850 mya. The first multicellular life is known to have occurred during this time period in the form of green algae. The small animal-like microorganisms known as the Acritarchs greatly increased in diversity in the Tonian era. The supercontinent Rodinia also began to break up at the end of this period. The Cryogenian period is the second period of the Neoprotozoic era. It began approximately 850 mya and ended around 630 mya. This period is known for its severe ice ages, at least two of them occurring in the Cryogenian. The first glaciation lasted 50 million years from 750 mya to 700 mya, while the second terminated around 635 mya, near the end of the Cryogenian. 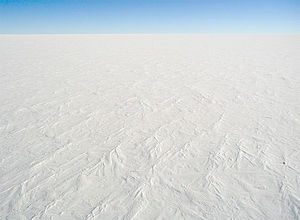 It is speculated that the glaciations were so severe that they covered the entire surface of the planet, resulting in Snowball Earth. It is also thought that this glaciation is what delayed the diversification of multicellular life that first appeared in the Tonian until the Ediacarian and the Cambrian. The supercontinent Pannotia also began to form during this period. The Ediacaran period lasts from 630 million years ago until 542 mya. It is the first period that sees the real diversification of multicellular life. Many primitive animals appear in this period or in the late Cryogenian. This diversification predates the Cambrian explosion and helps refute creationist claims that all complex life suddenly appeared in the Cambrian. The Ediacaran fauna is not as diverse as that which would follow in the Cambrian but primitive molluscs and arthropods have been identified. Sponges were also well-established by this time. Some Ediacaran fossils are problematic; scientists have trouble assigning them to a particular phylum of animals and some even speculate that some of these creatures represent extinct lineages of eukaryotes which are not animals. From 542 mya until today. This eon saw the evolution of all major phyla, including humans, who have only been on earth for around 3 million years (less than 200,000 in their modern form). This figure shows the genus extinction intensity, i.e. the fraction of genera that are present in each interval of time but do not exist in the following interval. The Paleozoic era happened around 542 million years ago to 250 mya. Life diversified at the beginning of this era in an event known as the Cambrian explosion. The Paleozoic is the first era of the Phanerozoic eon. It saw the colonization of land by first plants and then animals. Fish, amphibians, reptiles, and the ancestors of mammals all evolved during this era. The era went out with a bang as well in the Permian mass extinction in which scientists speculate that as many as 90% of living species at the time went extinct. The cause of this extinction event is suspected to have been climatic and environmental changes brought on by the formation of the supercontinent Pangaea, and the resultant glaciation when each end of the supercontinent passed over the North and South Poles although many other scientists believe that the Permian-Triassic extinction event was caused by a supernova that occurred close enough to earth to trigger a mass extinction such as the Permian-Triassic extinction event. The Paleozoic is divided in to six periods the Cambrian, Ordovician, Silurian, Devonian, Carboniferous and the Permian. A picture of the 6 foot predatory Arthropod Anomalocaris that lived during the Cambrian period and preyed on small animals such as Trilobites. The Cambrian spans from 542 to 488 mya. In the Cambrian period the first abundant fossils of hard-shelled animals appeared and animals were more diverse in the Cambrian than in the Proterozoic because of an event known as the Cambrian Explosion which was the geologically sudden appearance in the fossil record of the ancestors of more recent animals, estimated to take about 10 million years (from 530 to 520 mya) in the early Cambrian epoch. Almost all modern phyla (Except for the bryozoans which appeared later in the Ordovician period) had already appeared slightly before the Cambrian or in the Cambrian. Also, the first possible tracks on land, made by two species of Arthropods, referred to as Protichnites and Climactichnites, were made around 530 mya. Protichnites also may have been made by the ancestor of the predatory, scorpion-like arthropods known as the Eurypterids that thrived in the rest of the Paleozoic era. Trilobites which thrived throughout the early Paleozoic era also appeared in the Cambrian and they may have evolved from smaller soft-bodied forms such as Spriggina that lived in the earlier Neoproterozoic era. Traditionally it has been believed that land plants did not exist in the Cambrian period and the first land plants appeared later in the Ordovician period around 474 mya; however, the molecular clock suggests that land fungi may have appeared much earlier around 1 bya in the Tonian period of the Neoproterozoic era and plants may have appeared on land around 650 mya in the late Cryogenian period in the Neoproterozoic era. Also the Cambrian saw the appearance of warmer climates than in previous periods in the Proterozoic such as the Cryogenian period when the world-wide ice age Snowball Earth happened. The Ordovician began around 488 mya after an extinction event known as the Cambrian-Ordovician extinction event and ended around 443.7 mya with one of the most severe extinction events in earth history, the Ordovician-Silurian, in which 60% of all life went extinct. There are many hypotheses for why the Ordovician-Silurian extinction event may have happened. Some geologists and paleontologists suggest that it was caused by a short gamma-ray burst that destroyed most of the ozone layer and exposed terrestrial and marine surface-dwelling life to deadly solar radiation; however other scientists have suggested that an ice age at the end of the Ordovician period caused the extinction event because the end of the Ordovician was one of the coldest times in the last 600 million years of earth history. But however the majority of scientists agree that the Ordovician-Silurian extinction event had a multiple set of causes like the Permian-Triassic extinction event. Also the Ordovician featured an adaptive radiation of fauna though not as large a one as in the Cambrian explosion. Also the first plants, bryophytes (mosses), and fungus may have appeared on land in the Ordovician period. Although fish-like chordates such as Haikouichthys had existed on earth since the Cambrian period, the first true vertebrates, in the form of Arandaspis and its relatives, only appeared during this time period. The first Coral reefs appeared in the Ordovician period as well as the first jawed fish and the first primitive sharks which appeared later in the Late Ordovician epoch. Trilobites were still numerous and successful in the Ordovician and in the following Silurian period. Although primitive mollusks appeared much earlier in the Cambrian Period or in the Neoproterozoic Era they started to become abundant and diverse in the Ordovician Period. The Silurian period spans from 443.7 to 416 mya. The Silurian period was named after a Celtic tribe known as the Silures by a geologist known as Sir Roderick Murchison. Many evolutionary breakthroughs occurred during the Silurian such as the appearance of the first coral reefs although many paleontologists and geologists say that the first coral reefs appeared much earlier in the Ordovician period. The first vascular plants (such as Cooksonia) as well as the first true leeches and the first bony fish, the Osteichthyes appeared in the Silurian period. Fish reached considerable levels of diversity during the Silurian period and some species of fish evolved movable jaws. The Eurypterids (colloquially called "Sea Scorpions") became very diverse and one genus, Pterygotus grew to 4 meters long during the Silurian period. The Trilobites were still thriving in the Silurian period. Relatives of modern spiders and millipedes thrived alongside the earliest vascular plants in the Silurian period and mollusks also became more diverse during the Silurian. The climate in the Silurian was generally warm and earth was going through a green house phase during the Silurian period but however the climate cooled slightly in the late Silurian but in the Silurian-Devonian boundary, the climate became warmer again. Due to the warm climate much of the worlds ice caps melted in the Silurian period and contributed to a rise in sea level. The majority of continents converged at the equator and formed a minor supercontinent at the end of the Silurian known as Laurussia. The Silurian was ended my a minor extinction possibly caused by a meteorite impact or climate change. Tiktaalik roseae was a missing link between tetrapods and fish that lived around 375 million years ago in the Late Devonian period. Artist's illustration of a Devonian scene. The Devonian period occurred around 416 mya to 359 mya. The Devonian saw many changes in life on Earth, such as the evolution of the first tetrapods or four legged animals around 365 mya, the appearance of the first insects around 416 mya and the appearance of the first trees, Wattieza, and the first forests in the Late Devonian around 380 mya. The Devonian has also incorrectly been called a "greenhouse age", due to sampling bias: much of the early Devonian-age discoveries came from Eastern North American and western European strata, which at the time straddled the Equator as part of the supercontinent of Euramerica where fossils of widespread reefs indicate mostly tropical climates that were warm and moderately humid but in fact the climate in the Devonian differed greatly between epochs and geographic regions. For example, during the early Devonian, arid conditions were prevalent through much of the world including Siberia, Australia, North America, and China, but Africa and South America had a warm temperate climate. In the Late Devonian, by contrast, arid conditions were less prevalent across the world and temperate climates were more common. Also the armored jawless fish known as ostracoderms were declining in diversity and instead the jawed fish were thriving and increasing in diversity in both the oceans and freshwater. The supercontinent Pangaea also began to assemble in the Devonian. The Devonian ended with a mass extinction which killed off 75% of all life, known as the Late Devonian extinction. The causes for the Late Devonian extinction are not well known. The Earth's landmasses at the time of the Carboniferous-Permian boundary. The Carboniferous period occurred around 359 mya to 299 mya. The Carboniferous period witnessed many large steps in the evolution of life on earth such as the appearance of the amniotic egg (ie, the egg that can hatch on land without the embryo drying up) around 340 million years ago which allowed the first fully terrestrial animals. Initially they were primitive basal tetrapods such as Casineria around 314 mya; however, early reptiles like Hylonomus began to evolve and exploit new niches on the land around 314 mya soon after the basal tetrapods appeared (although the amniotic egg and primitive reptiles may have appeared earlier in the Carboniferous around 350 mya as the discovery of a new fossil tetrapod Westlothiana lizzae may suggest, but there is considerable debate as to whether W. lizzae was an early reptile or a primitive species of tetrapod). Also the Carboniferous was the first of the three golden ages of sharks or one of the three times in Earth's history that sharks were most diverse (the other three golden ages of sharks being the Triassic and the Eocene) because sharks reached one of their highest levels of diversity during the Carboniferous and replaced most large primitive jawed fishes such as Dunkleosteus as the dominant predators in the sea. Trilobites began to become extremely rare during the Carboniferous period because the majority of Trilobites went extinct in the Devonian-Carboniferous extinction event around 359 million years ago. Also Large primitive forests composed of very tall fern-like trees such as Lepidodendron, which grew to as high as 98 feet, spread across the equator during the Carboniferous period. Insects and amphibians were very large during this time, including some members of the order Protodonata (the Prodonta were an ancient order of insects that resembled dragonflies and were related to dragonflies but were much larger) such as Meganura moni and had wingspans of up to a meter wide), due to the large amount of oxygen produced by the expanding forests and the moistness of the environment. Many scientific estimates place the peak oxygen content as high as 35%, compared to 21% today. Due to the high oxygen content, wildfires would have been fairly common throughout much of the Carboniferous period. The climate during the Carboniferous was relatively cool compared to the climates of the Devonian, Ordovician and the Silurian due to the high oxygen content in the atmosphere. The supercontinent Pangaea formed during the Carboniferous although Pangaea reached its final form in the Permian period. Crassigyrinus scoticus was an amphibian from the Mississippian sub-period of Scotland. It is known from two specimens. The complete one is only missing its tail, which was probably long for better swimming. Crassigyrinus had small, very weak limbs that were virtually useless, therefore, this amphibian was almost completely aquatic. The Mississippian was the third sub-era of the Carboniferous period and lasted from 359 to 325 mya. The amniotic egg which allows the embryo to survive on land without drying up evolved in this sub-period along with the first fully terrestrial tetrapods, the basal tetrapods around 340 million years ago to enable animals to live a fully terrestrial existence. The Appalachian Mountains also appeared during the Mississippian sub-period. Also the small-shelled protists known as the foraminifera rapidly diversified during the Mississippian sub-era and reached their highest level of diversity during the Mississippian sub-period (although foraminifera existed since the Cambrian and still exist today in the Holocene epoch). Trilobites were rare during the Mississippian because many trilobites went extinct during the Carboniferous-Devonian extinction event around 359 million years ago, but the proetid group of trilobites continued to survive during both the Mississippian sub-period and the following Pennsylvanian sub-period. The Mississippian and the Pennsylvanian sub-periods are sometimes treated as separate geologic periods in North America although they are not considered separate periods in Europe and most of the world. The Pennsylvanian is a sub-period of the Carboniferous period lasting from roughly 325 to 299 million years ago. The Pennsylvanian saw the evolution of the first undisputed reptile, Hylonomus, around 314 million years ago. The Pennsylvanian witnessed the high point of primitive stem tetrapod evolution and primitive Synapsids made their appearance during the Pennsylvanian and early Synapsids and reptiles eventually replaced the stem tetrapods as the most successful group of tetrapods during the Paleozoic at the end of the Pennsylvanian sub-period. Also the Pennsylvanian sub-period saw the appearance of the order of large dragonfly-like insects known as the Protodonata which included the species Meganeura monyi which had a wingspan up to a meter wide. On the land, swamps and forests continued to expand throughout the equator and the tropics and hosted a variety of flora, such as tree ferns which grew to 15 meters (or 49 feet) in height and primitive Conifer-like plants which often grew as tall as 40 meters (or 131 feet). The Paleozoic supercontinent Pangaea first formed in the late Pennsylvanian as a result of a collision between the supercontinents Gondwana and Laurasia. The majority of coal used by humans comes from coal deposits dating back to the Pennsylvanian that were the remains of rotting vegetation which existed in the forests of the Pennsylvanian sub-period. The Permian, which spans from 299 million years ago to 251 million years ago, is the final period of the Paleozoic era. Although Synapsids appeared earlier in the Carboniferous period around 324 million years ago the Permian era witnessed the diversification of Synapsids or mammal-like reptiles and their descendants. Early Mammals descended from some of the early Snapsyds that survived the extinction at the end of the Permian eon. Many other important groups appeared in the Permian such as the first Coleoptera (beetles), the first Diptera (flies) and the first Archosaurs which would later evolve into the Dinosaurs in the Triassic. Carboniferous flora (and giant insects) still thrived at the beginning of the Permian period although Carboniferous flora began to become less common in the middle Permian because the climate began to become drier, the temperature greatly increased, and the level of oxygen in the atmosphere dropped, and as a result the more hardy conifers began to replace older species of conifers such as Lepidodendron and Sigillaria although more primitive conifers such as Lepidodendron and Sigillaria. Giant insects and amphibians, however, continued to thrive longer on the small island continent of South China than on the mainland of Pangaea. The majority of the world's land masses except some small islands and portions of Asia (such as South China) were united into one large continent known as Pangaea and as a result the climate varied extremely across Pangaea and it also appeared that deserts were widespread across the Pangaean landscape. The end Permian extinction event was the most severe extinction in the last 600 million years of geologic history because (many scientists estimate that) the Permian-Triassic Extinction Event killed off anywhere from 90 to 99% of life on Earth. There are many explanations for why the Permian-Triassic extinction event happened including a meteor impact, a hypernova that occurred very close to the earth, a change in the climate, or a combination of all of those causes that is often humorously referred to by many paleontologists as Murder on the Orient Express. The earliest dinosaur, Eoraptor, appeared in the middle Triassic around 230 or 225 mya. Procolophon were a genus of lizard shaped reptiles with at least 8 species that persisted through the Permian-Triassic extinction event, only to die out in the early stage in the evolution of the Dinosaurs. The Mesozoic lasted from 251 mya to 65 mya. This is the age of the reptiles and dinosaurs. The Mesozoic era saw the evolution of angiosperm plants as well as birds. Mammals existed during this period but for the most part were small because dinosaurs and other large reptiles were the dominant fauna of the day. Birds evolved from small carnivorous therapod dinosaurs. The era ends with the Cretaceous mass extinction 65 million years ago when an asteroid collided with the Earth. The Triassic period, which ranges from 248 mya to 199 mya, was the first period in the Mesozoic era. Life on Earth was less diverse and less numerous in the Triassic than in the Permian period due to the Permian-Triassic extinction event. Many new life forms evolved to fill the massive number of niches left open by the Permian-Triassic extinction event such as the predatory aquatic reptiles known as the ichthyosaurs, the first flying reptiles known as the Pterosaurs, and the first dinosaurs and the first mammals, although the dinosaurs were not the dominant animals on land during the Triassic and the dinosaurs became successful only after the end Triassic extinction occurred and the mammals only became successful in the Paleocene after the dinosaurs went extinct in the Kt Event millions of years later. Many flora and fauna that survived the Permian-Triassic extinction event flourished (such as the cycads which formed large forests and were the dominant flora of the Triassic). The earliest species of turtles appeared in the late Triassic era. The Triassic was the second golden age of sharks because sharks also increased greatly in diversity in the Triassic due to the large number of niches left open by the Permian-Triassic extinction event. Most of the world's land masses were still joined in one supercontinent known as Pangaea. The climate in the Triassic was somewhat similar to that of the Permian because it was generally dry and was prone to extreme changes and cross-equatorial monsoons due to the fact that large landmasses such as Pangaea often have changing and unstable climates. The Triassic period ended around 199 million years ago in a major extinction event known as the Triassic-Jurassic extinction event which eliminated 50% of life on earth and allowed the dinosaurs to dominate the following Jurassic and Cretaceous Periods. Allosaurus (IPA pronunciation: /ˈæləˌsɔɹəs/) is a genus of large (up to 9.7 m long) theropod dinosaurs that thrived in the Jurassic period. The Jurassic was the second geological period in the Mesozoic era that began around 199 mya and ended around 144 mya. The flora and fauna of the Jurassic was vastly different from the flora and fauna of the previous Triassic period. The Jurassic was the first geological period that archosaurs such as the dinosaurs were the dominant organisms on Earth. Also the first birds (such as Archaeopteryx) evolved from small feathered dinosaurs such as Compsognathus in the Jurassic period. Marine reptiles such as ichthyosaurs, plesiosaurs and marine crocodiles were also very common during the Jurassic period. The terrestrial flora was dominated by many Families of conifers such as the Araucariaceae, Cephalotaxaceae, Pinaceae, Podocarpaceae, Taxaceae and Taxodiaceae. Ginkgos and tree ferns were also common in the forests of the Jurassic period although Ginkgos were less common in the Southern Hemisphere than in the rest of the world. Cycads were still abundant in the Jurassic period. Many new groups of invertebrates appeared during the Triassic, such as rudists, a reef-forming variety of bivalves and belemnites. Also the infraorder of large predatory dinosaurs known as the Carnosaurs which thrived throughout the Jurassic and Cretaceous and included the famous order of dinosaurs known as the Tyrannosaurs evolved and thrived during the following Cretaceous period. The supercontinent Pangaea began to break up in the Jurassic into two smaller continents, Laurasia and Gondwana. The climate in the Jurassic was usually less dry than that of the Triassic period and as a result lush jungles began to cover much of the landscape. Quetzalcoatlus (named for the Aztec feathered serpent god Quetzalcoatl) was a pterodactyloid pterosaur known from the Late Cretaceous of North America (Campanian-Maastrichtian stages, 84-65 mya), and one of the largest known flying animals of all time. It was a member of the Azhdarchidae, a family of advanced toothless pterosaurs. The Cretaceous period was the final period of the Mesozoic era. The Supercontinent of Pangaea completed its breakup into modern contents during the Cretaceous period. The supercontinent of Gondwana was intact at the beginning of the Cretaceous although it broke up into smaller modern landmasses in the Middle and Late Cretaceous. The climate in the Cretaceous was mostly warm and humid. However the climate in the Cretaceous was not as humid as in the Eocene epoch. Many new clades of dinosaurs such as the Ankylosaurians and the Tyrannosaurs (which included the famous carnivorous dinosaur T. rex that thrived in the late Cretaceous from 70 to 65 mya) appeared around the end of the period. Marine reptiles such as ichthyosaurs, plesiosaurs and mosasaurs were still common throughout much of the Cretaceous. The insects increased in diversity in the Cretaceous and the first ants, termites and mosquitoes evolved during the Cretaceous period. Modern sharks also became more diverse in the Cretaceous than in previous periods. The large flying reptiles known as the Pterosaurs (such as Quetzalcoatlus who was 40 feet long) declined in diversity during the Cretaceous due to competition with modern birds and eventually went extinct with the dinosaurs in the K-T event around 65 mya. The Cretaceous period ended around 65 ma in an extinction event known as the K-T event. 50%-85% of life on earth, including the dinosaurs and the ammonites, went extinct during the K-T event around 65 mya. The K-T event allowed early mammals to dominate the land and diversify into many niches left open by the K-T event in the following Cenozoic era. The Cenozoic era began around 65 million years ago and continues today. It's also known as the age of the mammals. The continents drifted into their current locations and life began to progressively look more modern throughout the era. Grasses survived the K-T extinction but developed further during this era, as did the simians, who in part became the apes, and our direct ancestors. At the end of the Cenozoic era, a bipedal primate resembling humans emerges. The Cenozoic is divided into two periods and seven epochs. There are two systems for dividing up the Cenozoic into periods. The traditional one groups the first five epochs into the Tertiary and the Pleistocene and Holocene into the Quaternary. However, now scientists have renamed the Quaternary the Neogene and placed the Miocene and Pliocene in with the Pleistocene and Holocene. The Tertiary has been renamed the Paleogene, which now consists of the Paleocene, the Eocene, and the Oligocene. For simplicity's sake, only the epochs will appear here. The Paleocene was the first epoch of the Cenozoic, immediately following the Cretaceous mass extinction event. The epoch lasted around 10 million years from 65 mya to 55 mya and saw the exploitation of niches by mammals. The most successful group of mammals are the placental mammals (to which we belong) and by the end of the Paleocene, small rodent-like mammals had spread across the Earth and had already begun diversifying into new, larger forms. Also large flightless predatory birds known as Terror Birds (such as the six-foot terror bird known as Gastornis) appeared during this time. Marine life at the beginning of the Paleocene was not very diverse due to the KT-event but marine life greatly increased in diversity later in the Paleocene and sharks began to become abundant again due to the extinction of the predatory aquatic reptiles that dominated the seas in the Jurassic and the Cretaceous periods and the tropical conditions of the Paleocene. Although it is usually thought that the dinosaurs went extinct before the Paleocene a hadrosaur leg bone has been found in Paleocene strata dating from 64.5 mya which may indicate that some clades of dinosaurs may have survived the K-T event and may have persisted into the early Danian stage of the of the Paleocene. A fossil of Leptictidium nasutum. Leptictidium (Latin: graceful weasels) was a genus of small prehistoric jumping mammals. They were in existence during the Cretaceous period and they survived the Cretaceous-Tertiary extinction event well into the Eocene. They were widespread across Europe and North America, but they died out around 40 mya, leaving no descendants. An illustration of an Ambulocetus, its back legs in swimming position. The Eocene was the second epoch of the Paleocene. The Eocene epoch occurred around 55 mya to 34 mya. Animals resembling modern birds first evolve, and the perissodactyls have already begun diversifying into horses, rhinoceroses, palaeotheres and brontotheres. Mammals in the Eocene (such as Leptictidium and Propalaeotherium) were generally 60% smaller than animals in the Paleocene because the world's climate was much warmer during the Eocene than in the Paleocene and tropical rainforests covered much of the world at this time. It also has been noted that the first primates appeared in the Eocene around 55 mya; however new fossil evidence and the molecular clock indicate that Primates may have appeared earlier in the Cretaceous period around 80 mya. Also the Eocene was the third golden age of sharks because sharks reached a considerable level of diversity in the Eocene. Primitive, crocodile-like, carnivorous amphibious whales such as Ambulocetus evolved from early dog-like hoofed animals such as Pakicetus around 50 million years ago in the early Eocene and large carnivorous saltwater whales such as Basilosaurus gradually evolved from amphibious whales around 39 million years ago in the late Eocene. Also the first horse, Hyracotherium, appeared around 50 mya in the early Eocene epoch. The ground sloths of the genus Megatherium were among the largest mammals in the New World, with some species, such as M. americanum, growing to be as large as an African Elephant. The ground sloths of the genus Megatherium thrived during the Pleistocene epoch. The Oligocene was the third epoch of the Cenozoic era. The Oligocene epoch extends from 34 mya to 23 mya. Snakes and lizards diversified during this era. While mammals were the dominant fauna of the day, reptiles were still more abundant during this epoch than they are today. The Oligocene period's name comes from the Greek words ὀλίγος‚ (oligos, few) and καινός‚ (kainos, new) because of the scarcity of additional modern mammalian faunas after the Eocene period. The Oligocene epoch began at the end of a major extinction event which most likely resulted from a multiple set of events including climate change, a drop in sea level and the impact of several asteroids in Siberia. Also although Grasses evolved earlier, the Eocene grasses became much more diverse and expanded beyond the waterbank habitat of the Eocene into more open habitats during the Oligocene epoch. Snakes and lizards also diversified during the Oligocene epoch. The climate in the Oligocene epoch was cooler than the climate of the Eocene but was warmer than today's climate. Osbornoceros was a prehistoric antilocaprid genus belonging to the family Antilocapridae, of which all its species are extinct except for the pronghorn. The megalodon, Carcharodon megalodon, was a giant prehistoric shark that probably lived between about 16 to 1.6 mya in the Miocene, Pliocene and the Pleistocene eras. It is likely the largest predatory fish to have ever lived. It may have been up to 52 feet long. This is a size comparison between a Megalodon, other sharks and a human. The Miocene was the fourth epoch of the Cenozoic period. The Miocene occurred around 23 million years ago to 5 mya. This epoch saw the evolution of wolves, raccoons, bears, modern crows, modern ducks, and apes. At the end of this epoch it is believed that humans and chimpanzees shared their last common ancestor around 7 mya. Miocene fauna in most of the world was similar to modern fauna although the fauna of Australia and South America were noticeably more primitive than the rest of the world's fauna due to geographic isolation. The marine fauna of the Miocene was also very similar to the marine fauna of today. Modern sharks began to become more common in the Miocene and the largest predatory fish that ever lived, the prehistoric shark megalodon, also evolved during this period around 16 mya and continued to thrive into the early Pleistocene when it went extinct around 1.6 mya. Although the climate of the Miocene was noticeably warmer than today it mas more similar to the modern climate than that of previous epochs. The world began to look more modern in the Miocene although Florida and large parts of Europe were still underwater and South America and North America were not connected and were geographically isolated from each other. The Pliocene was the fifth epoch of the Cenozoic. The Pliocene lasted only 3 million years, from 5 million years ago to 2 million years ago. This epoch saw hominids progressively become more human. At the end of the epoch, the earliest members of the genus Homo evolved. The Pliocene epoch also saw a cooling climate which ended with the Pleistocene glaciations. Also the land bridge between North and South America known as the isthmus of Panama formed around 3 million years ago and allowed for the exchange of fauna between North America and South America, but the joining of landmasses also diverted a cross-equatorial current that had flowed between North and South America since the Mesozoic Era toward North America and Europe, thereby creating a warmer climate in Europe and North America. The first saber-toothed cats and the first Hyenas also appeared during this time. Ice caps formed at the poles during the Pliocene around 3 million years ago. The primate population in Europe and Asia declined during this time but rodents slightly increased in diversity in Europe and Asia as well as the Americas during the Pliocene. The Terror Birds also went extinct during this period. Seals, whales and sea lions thrived in the Pliocene oceans. The Pliocene ended with a minor extinction event that was possibly caused by a set of supernovas that occurred somewhat close to earth. Estimates of the atmospheric CO2 level range from 350 to 450 ppm in the mid-Pliocene. As of 2017 CE, atmospheric CO2 has risen to above 400 ppm. Consequently, scientists have been considering the Pliocene as a model for what the Earth will be like during the near-term in the era of global warming. Based on paleontologic studies of the Pliocene, some of the changes that might occur in the near future include, high arctic forests, arctic forest fires, changes in global ocean circulation (which affects adjacent land climate), and differential effects in arctic-antarctic temperatures (one cooling while the other warming). The woolly mammoth was a common Pleistocene mammal. The Pleistocene was the sixth epoch of the Cenozoic era, lasting from 2 million until 12,000 years ago. It is also known as the Ice Age. The Pleistocene is fondly remembered for its megafauna such as giant sloths, mastodons, woolly mammoths, and Neanderthals. This is the first epoch in which clearly recognizable humans are present from start to finish. Modern humans evolved in the Late Pleistocene around 200,000 years ago. The epoch ends with the retreat of the last glaciers and the advent of agriculture. Some argue that we are still in the Pleistocene and that the current interglacial period will come to an end within the next few thousand years. Apparently we are already due for an ice age (although anthropogenic global warming may be preventing it from happening or at the very least may be delaying it). The end of the Pleistocene was marked by retreating glaciers and by the extinction of many large megafauna including mammoths, giant sloths, saber-toothed cats, and Neanderthals. What Earth looks like today, in the Holocene. Çatalhöyük was an early large Neolithic and Chalcolithic settlement in southern Anatolia that was an example of early human farming societies that existed in the Neolithic. The Holocene is the current epoch, in which we now live. It marks the entire time scale of modern human civilization from the advent of agriculture in the Neolithic to the present. It started around 10,000 B.C. and is ongoing. Young Earth Creationists believe that the entire history of the universe occurred during the Holocene, ignoring (or denying) critical fossil, geological, molecular, genetic, and astronomical evidence. Throughout the history of life there have been many major extinction events where anywhere from 50% to 90% of species go extinct in a very brief amount of geological time (usually less than one million years). Causes of major extinctions have included global climate change, possible supernovas of nearby stars, massive volcanic eruptions, asteroid/comet collisions with the earth, and now a mass extinction event in modern times caused by a bipedal ape. The Ordovician-Silurian Extinction Event occurred about 444-447 mya and 49% of genera of fauna went extinct during this event. It is believed to have been caused by a drop in sea level due to glacier formation from an ice age in the Hirnantian faunal stage of the Ordovician period which ended the warm greenhouse like climates that were common throughout the Ordovician. The level of CO2 in the atmosphere dropped which affected the climate and life in the seas. Scientists from the University of Kansas and NASA have suggested that a gamma-ray burst that occurred close to earth may have triggered the extinction by stripping away half of the earth's ozone layer which would have caused a drop in temperatures and would have killed many species. Although the event is plausible there is very little astronomical evidence that a such a nearby gamma-ray burst occurred around the time of the Ordovician-Silurian Extinction Event. This extinction event occurred about 364 to 359 million years ago. It is clear that there was a decrease in biodiversity during the Late Devonian Extinction Event but scientists are unsure how long the event took place, with estimates ranging from 15 million years to 500,000 years. The Late Devonian Extinction Event mostly affected marine organisms; terrestrial organisms were not severely affected. Tetrapods began to colonize land just before this period around 365 million years ago. The beginning of the formation of the supercontinent Pangaea led to the reduction of shallow-water marine environments, leading to the extinction of all placoderms, all trilobite groups except for Proetida, the last armored jawless fishes, many ammonites, and numerous other groups but many scientists believe the beginning of the formation of Pangaea was not the only cause of the Late Devonian Extinction Event and that the event had multiple causes including a meteorite impact and global cooling caused by the expansion of primitive forests. The Permian-Triassic extinction event occurred about 251 to 248 mya. It was the worst extinction event ever to rock the planet; it's believed to have killed about 90%-99% of the species which were alive at the time. The supercontinent Pangaea existed at this time and some speculate that its formation may have contributed to the extinction event. Some scientists speculate that an asteroid or comet collision caused the event (much like the more familiar Cretaceous Extinction Event) although no evidence has been found to support that. Other scientists believe that the cause was flood volcanism from the Siberian traps and a deoxygenation of the seas as a result . However many scientists believe that the Permian extinction was caused by a supernova that occurred close to the earth that destroyed the ozone layer for several years but the time the supernova took place and the extinction rate (96% marine, 70% terrestrial) is inconsistent with the supernova hypothesis which has led many scientists to conclude that the Permian-Triassic Extinction Event was caused by a combination of two or more of the causes listed above. This hypothesis is humorously known as Murder on the Orient Express. The Triassic-Jurassic Extinction Event Occurred around 200 million years ago. This event was believed to have been caused by massive volcanic activity in what would later be the Atlantic Ocean (although many other causes have been suggested such as an Asteroid impact but geologists and paleontologists have not found an impact crater that can be dated to coincide with the Triassic-Jurassic boundary, and gradual change in the world's climate and sea level has also been suggested as a possible cause of the Triassic-Jurassic Extinction Event. Pangaea began to break up during this time and the volcanic activity may have led to global warming which resulted in a mass extinction event, although not as deadly as what happened in the End Permian Event. This extinction event would allow dinosaurs, which had evolved in the Triassic, to become the dominant fauna of the Jurassic and Cretaceous periods by eliminating organisms that previously occupied the dinosaurs' ecological niches. The Cretaceous-Tertiary Extinction Event was the most well-known extinction event in earth history. Also known as the K-T Extinction event, it represents the boundary between the Age of the Dinosaurs and Reptiles and the Age of Mammals. It occurred approximately 65 million years ago, likely as a result of an asteroid collision with the earth. However many scientists suggest that the event could have occurred more gradually and been caused by a set of asteroid collisions rather than one single collision because there is very little evidence for the existence of a crater large enough to be caused by an asteroid massive enough to cause such a large extinction event. Scientists also once suggested a that a supernova caused the Cretaceous-Tertiary Extinction Event but the absence of the plutonium isotope Pu244 disproves this hypothesis because the fallout from a supernova explosion would contain that isotope. The resulting climate change from the collision led to the death of approximately 50% of all species including the non-avian dinosaurs. Although it's not considered one of the "Big Five", we now seem to be in the midst what could be the Sixth Major Extinction Event. The main cause of this event is thought to be a single species, Homo sapiens. The extinction event began in the late Pleistocene with the extinction of our contemporary Homo species, Homo neanderthalensis and Homo florensis as well as the extinction of Pleistocene megafauana such as mammoths, giant sloths, and saber-toothed cats. The extinction event continues into historical times with the Dodo, aurochs, and the Great Auk going extinct, among many others. Since 1500 AD, 784 documented animal extinctions have taken place but this is only what we know about. Human-induced climate change and deforestation are rapidly accelerating the extinction rate of species we may not even know about. It is possible that this may end up to be the worst extinction event to occur since the Permian. Some scientists and environmentalists suggest as many as 70% of the earth's fauna will go extinct in the Pleistocene-Holocene Extinction Event if humans do not change their lifestyles to be more environmentally friendly. Alternatively humans may become extinct too, though given our adaptability as a species that seems unlikely. Scientists recognize three domains of life which are all descended from a common ancestor. The first two, Eubacteria and Archea, are single celled prokaryotic organisms who would both be commonly referred to as bacteria. The third domain is Eukarya which includes complex eukaryotic single celled organisms as well as complex multicellular life such as plants, fungi, and animals. All three domains share a common ancestor that has been dubbed LUCA (Last Universal Common Ancestor). Scientists once believe that LUCA was a single organism but they now believe that LUCA was actually a community of primitive bacteria. The last common ancestor lived early in Earth's history but scientists have concluded that LUCA was not the first organism but that the first organism was instead a more primitive RNA based lifeform. The Archean and Bacteria domains are also thought to have branched off relatively early in Earth's evolutionary history but after the time of LUCA. Bacteria and Archeans have existed for most of the Earth's history but Eukaryotic cells have only existed for 2 billion years. The evolution of the Eukaryotic cell is what permitted the later evolution of complex multicellular life. This is the most common domain of prokaryotes. Bacteria have existed in similar form for over 3.5 billion years. They have a single linear chromosome and no organized nucleus. They reproduce by fission: the chromosome duplicates and the cell splits into two daughter cells. Bacteria are unicellular but they can be colonial. Photosynthesis was first developed by cyanobacteria which were the ancestors of modern chloroplasts that are found in plants. This group of organisms is known for living in extreme conditions. They can be found in volcanic vents, in the deep sea, in the Antarctic, and in extremely salty environments. These organisms show that life can survive in even the most extreme environments. Like bacteria, they have a single chromosome and are unicellular. Despite some similarity to bacteria, archeans are actually more closely related to Eukaryotes. The domain of life to which we belong, eukaryotes are complex lifeforms which can be unicellular but are often multicellular. Eukaryotes have a membrane-bound nucleus and membrane-bound organelles (which are the remnants of trapped bacteria). Eukaryotes evolved around 2.1 billion years ago and diversified into multicellular life around 1 billion years ago in the Tonian period. Eukaryotes have also incorporated bacteria into their cells, trapping bacteria which later became mitochondria (in animals) and chloroplasts (in plants and algae). Complex multicellular eukaryotic life evolved around 610 million years ago in the Ediacaran period. Eukaryotes are the only types of cells which are known to specialize. Because of this, complex organisms were able to evolve. Eukaryotes include single-celled protists and algae as well as fungi, plants, and animals. 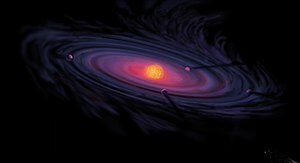 ↑ See the Wikipedia article on Stellar evolution. ↑ An Estimate of the Prevalence of Biocompatible and Habitable Planets by Martyn J. Fogg J. Br. Interplanet. Soc. 1992 Jan;45(1):3-12. ↑ Once Upon a Water Planet: Today the Red Planet is dry and barren, but what about tomorrow? New data suggest that the long story of water on Mars isn't over yet. (March 12, 2002) NASA (archived from August 30, 2009). ↑ How did Earth get its water? The answer lies in deuterium ratios and a theory called the Grand Tack by Christopher Crockett (11:14am, May 6, 2015) Science News. ↑ Fossil from a forest that gave Earth its breath of fresh air by Lewis Smith (April 19, 2007) Times Online. ↑ Ancient Animals Got a Rise out of Oxygen Vol. 147 #19, May 13, 1995 Science News. ↑ All About Archaeopteryx by Chris Nedin (1999) The TalkOrigins Archive. ↑ 11.0 11.1 What the Pliocene epoch can teach us about future warming on Earth: About 3 million years ago, carbon dioxide levels were similar to today’s. What other changes might we expect? by Alexandra Witze (8:00am, November 28, 2017) Science News.